I’m currently spending a week touring the Shetland islands bringing my harp, tunes and stories in live performances to patients, residents, children and staff at 10 different care settings across the islands. 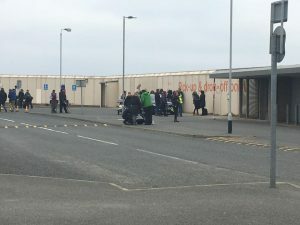 The trip is being organised by the fantastic organisation Music in Hospitals Scotland and has been made possible thanks to Total E&P UK Limited. Today started with a bit of a different concert to an audience around 50+ years younger than who I’ve been playing to so far this week! I spent the morning with the students of the ASN unit at Anderson High School and ah, it was so much fun! They learnt all about the harp, “Air harped” with me and even managed to a brief go on the instrument itself. The time went so fast but I was very pleased that a Totalrepresentative and photographer were there to catch some of the special moments we had… hopefully I’ll be able to share some of the photos at a later date. 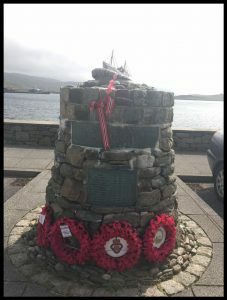 But back to the reason why I was there…I had a lovely final concert in Scalloway which was both to residents and day guests at the home. I even met one of my Glasgow students auntie who works there!! Since the last concert I’ve been packing my bags for flying home and I’m now at the airport waiting to board my flight. 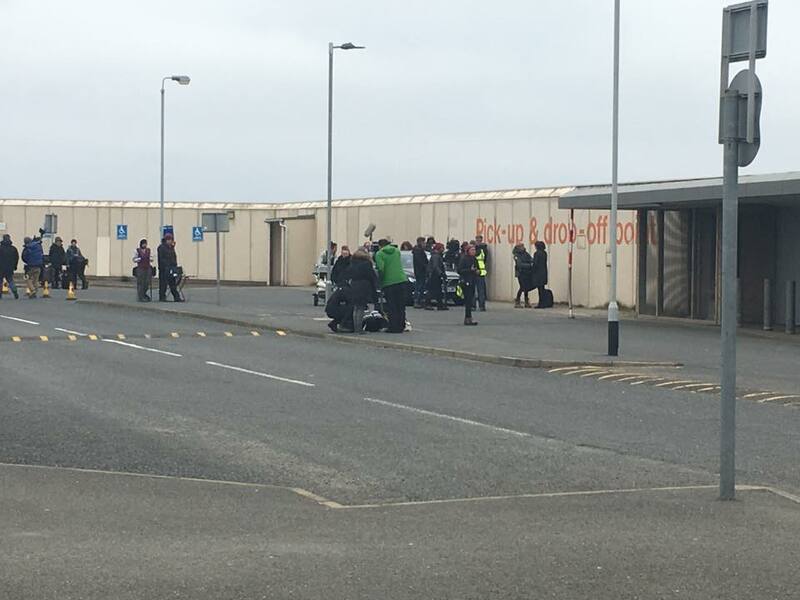 It’s all happening here as they’re filming the ITV series Shetland. I’ve spotted them around the islands quite a bit and several times have been asked if I’m part of the crew. Do I have a TV crew look about me?!? Maybe it’s my love of high top trainers…. 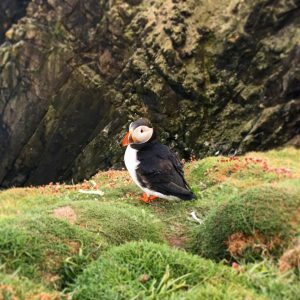 Oh and last night after posting my tour diary I drove down to Sumburgh head and FINALLY saw some beautiful puffins! They were worth the last minute drive. 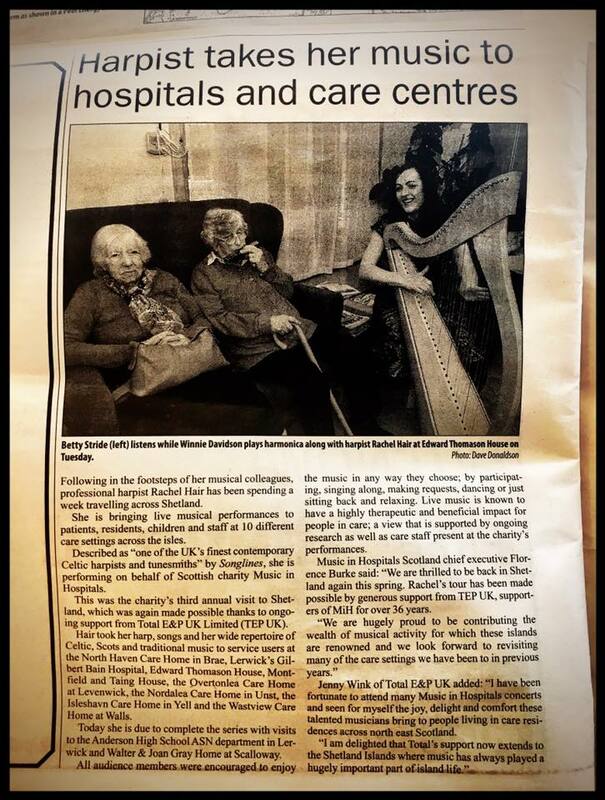 I also made the local rag today… the Shetland Times, with my new harp (blues harp harmonica! )duo partner Winnie! It really has been a fantastic tour and I’d like to take this chance to thank the staff at Music in Hospitals Scotland, particularly Kirsty, for organising it for me. I’d also like to thank Total for sponsoring it as it really would not have happened without them. 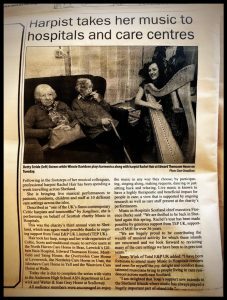 It really has been an amazing and at times humbling experience to take my music into the care homes and hospitals and see the clients faces just light up. It’s also been great to be able to just natter with them, their families, friends and staff… so important to make time for this.